The social networking site, 500px, widely used by photographers has launched a redesign ahead of the upcoming Flickr revamp. 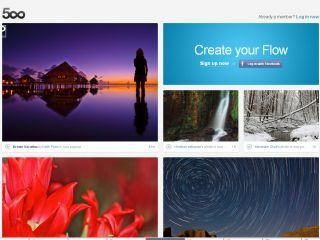 It was revealed that a new Flickr site interface will be rolled out on February 28th earlier this week, but users of 500px will notice that it has already improved the interface. The new main page is populated with photos in varying sizes and orientations, giving more than a passing resemblance to the increasingly popular Pinterest social network. Other updates to the site include improved profile pages and better prominence for blogposts. Smaller tweaks such as the ability to add photos already uploaded without uploading them again have also been added. Perhaps most interesting though is the addition of the "Market", which allows people to buy digital downloads of images, or order large canvas prints. Flickr's new revamp includes an improvement to the way photos are uploaded, and a new interface for displaying photos. Maintaining its position as the most popular dedicated photography sharing site, Flickr has been faced with increasing competition from all-encompassing sites such as Facebook and Google+. 500px tends to be favoured by enthusiast photographers, and although it has been around since 2009, it has recently been growing in popularity. By October 2011, its user base had grown to around three million. Like Flickr, it has both free and paid-for options, with free customers limited to uploading 20 photos a week.